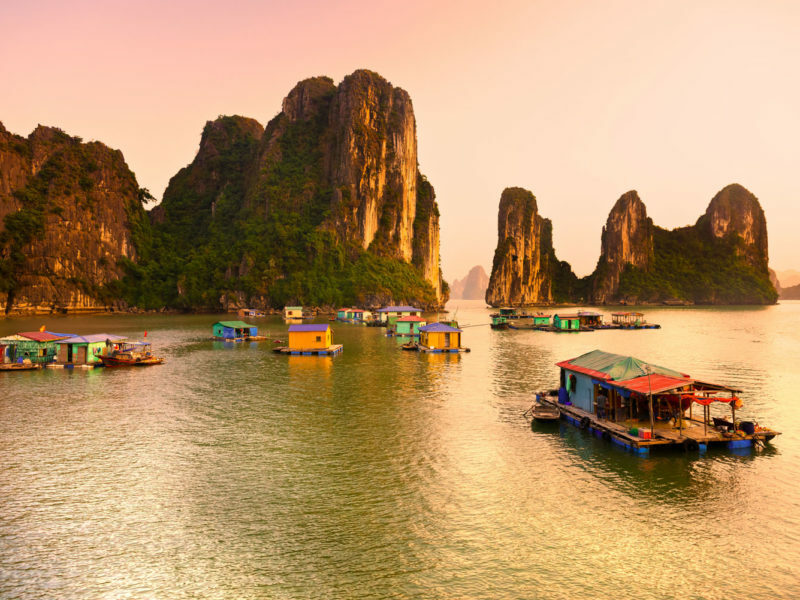 Halong Bay - a must-visit destination for any first-timer in Vietnam. Planning your first time to Vietnam? Here we cover all the basics you need to know before booking. Generally speaking, avoid wearing singlets, short skirts and skimpy clothing unless at the beach, particularly outside the main city centres. This is especially important when visiting temples, where women must have their shoulders and legs covered. We suggest investing in a few good T-shirts, light pants, long skirts and a sarong. A good rule of thumb is that if something has a price tag on it, the cost is non-negotiable. For example, it’d be in poor taste to try and bargain down the bill at a restaurant with a menu list or in a bricks-and-mortar store, as opposed to a market stall. As for everything else, it’s usually open to haggling. Starting out, make sure you get an idea of what locals pay for similar items so you know what is a reasonable price. In touristy areas, the wealthier you appear, the more the product is often overpriced. After explaining it’s too expensive for you, try to aim for a price that is roughly two thirds the starting price (or even half if you feel necessary). But as always, remember to play nice! 1. Do not touch someone’s head. 2. Pass items with both hands. 3. Do not point with your finger – use your hand. 4. Do not put your hands on your hips or cross your chest with your arms. If you are out in public areas, open displays of affection with a partner are frowned upon, including kissing, holding and touching hands. 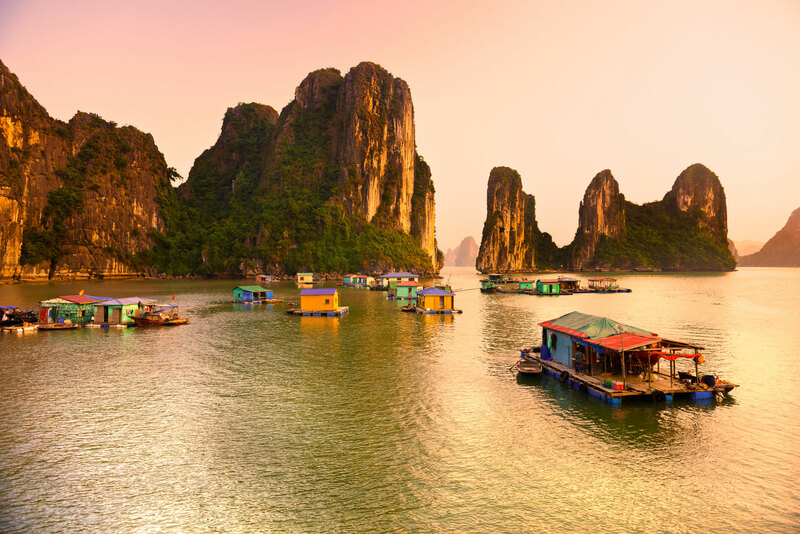 The Sydney Harbour of Vietnam, Halong Bay is a world-renowned icon that’s a rite of passage for visitors. A UNESCO World Heritage site, it features some 2000 islets, most of which are limestone, surrounded by striking teal-blue water. Significant culturally, historically and economically with the thousands of tourists who visit each year, the best way to experience Halong Bay is on board a multi-day cruise. Essentially a living museum, Hoi An’s Ancient Town showcases this trading port’s unique past, dating from the 15th to the 19th century. With a unique mixture of east and west in its architecture, here you can see Chinese temples, a Japanese-designed bridge, pagodas and French-colonial houses. In fact, Hoi An has been so successfully preserved and restored, it has been declared a UNESCO World Heritage site. Head to Hoi An Riverside in the evening when it is especially atmospheric, lit up by old-fashioned lanterns and dotted with hawker stalls. Known as ‘Vietnam’s rice bowl’, the Mekong Delta stretches from Ho Chi Minh’s city limits southwest to the Gulf of Thailand, producing almost a third of the country’s annual food crop. While rice may be the dominant crop seen along the delta, you can also expect to see coconut palms, fruit orchards and the iconic Vietnamese vista of conical-hatted farmers tending their land. Another UNESCO World Heritage site, this landmark is located in Hue – the former capital city of Vietnam – in the country’s centre. As the political, cultural and religious centre of Vietnam under the Nguyen dynasty until 1945, the Complex of Hue Monuments encompasses hundreds of historic monuments and ruins such as the Forbidden Purple City (once the residence of the royal family), the Imperial City, royal tombs, flag tower, pagodas, temples, a library and museum. Just northwest of Ho Chi Minh City in Vietnam’s far south, the Cu Chi Tunnels involve some 250 kilometres of underground channels in a network that extends underneath the city. Initially hand-dug with simple tools during the French occupation in the 1940s, the tunnels were expanded during the Vietnam War in the 1960s and used by the Viet Cong to hide from American soldiers. Today you can get a taste of this guerilla warfare with various tour operators taking travellers into certain sections of the tunnels on a daily basis.